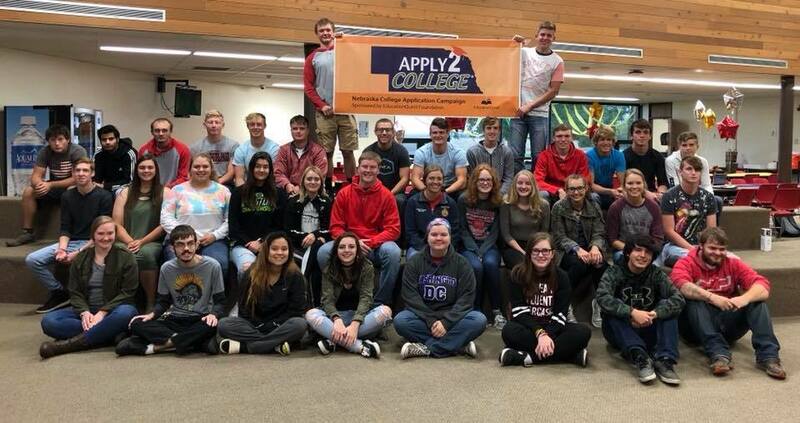 Valentine High School is among 22 Nebraska high schools selected to receive a College Access Grant from EducationQuest Foundation. The school will receive $5,000 a year over the four years to develop or enhance programs designed to increase the number of students who pursue education beyond high school. The high school will use the grant to fund programs and activities such as college visits, college fairs, FAFSA completion days, financial aid sessions, scholarship searches, career exploration, and completion of college applications. The grant program also promotes involvement with families and businesses to help ensure the program’s success. Thus far, funds have been used to support juniors and seniors as they attended college fairs in Mullen on September 11 and in Ainsworth on September 18. Approximately 40 representatives from four-year colleges, two-year community colleges, and the various branches of the military were in attendance. This was an excellent opportunity for our students to learn of the various paths they can pursue after high school. Students earned a gift card from Casey's for speaking with at least 3 representatives and completing a "Which path is right for me?" activity. During our Apply to College campaign, seniors explored careers and discussed the importance of finding a college that is a good fit. They also learned how to pay for their higher education, and, we are proud to announce, every senior has applied to at least one college (for most, it is several). They celebrated this important milestone with a senior breakfast during On to College. UNK and Central Community College in Hastings on October 31. Tours – Would you allow a tour of your facility and explain all the levels of employment available within your business? Your Other Ideas – What other ways would you like to help us increase our college-going rate?